Is your Child at Risk for Molluscum contagiosum? Molluscum contagiosum is an infection caused by molluscum contagiosum virus on the skin. Infection develops when molluscum virus enters into skin through a scratch or break in the skin. Eruptions of molluscum are flesh coloured or pinkish white bumps which look like small warts. The eruption of molluscum at its core has white waxy pus which contains the virus. Thus scratching the lesions and touching other areas of body with same hands, or touching others, or touching various objects with same hand will spread the infection. Most commonly children of age group of 1-12 years are affected. Rarely this infection is also found in teens and adults. Sportsmen who are into contact sports like wrestling, football are also seen to have this infection as it spreads by direct skin to skin contact. Contaminated objects used by infected kids can spread the disease e.g. towels, bathing sponges, toys, beddings or bed linen. 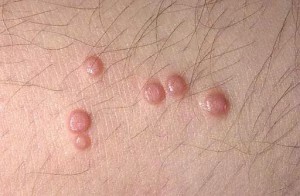 There is possibility of your child acquiring the infection by sharing towel or toys or other such articles with other kids who already have molluscum contagiosum lesions. Virus can also spread by sharing of swimming pools, pool equipments, saunas and baths as the virus survives better in damp and warm environments. Amongst sports persons, spread can occur via contaminated sports equipments. Virus may spread from one person to other by direct skin to skin contact. Your child may acquire this infection from other kids if he touches the lesions of molluscum accidently while playing. Virus may spread from one region of body to another. This happens when your child touches other regions of the body after scratching the molluscum with the same hands. Sexual spread: This is most commonly seen in late teens or adults having molluscum lesions on the genital region. The source of infection is sexual contact with a partner who is already infected with molluscum. The molluscum virus is found only on the uppermost layer of the skin i.e. epidermis and doesn’t enter blood. Hence except for direct skin to skin contact there is no other means (e.g. coughing or sneezing droplets) by which infection can spread. Once a person is cured of molluscum infection he is totally free from the virus and he doesn’t carry virus even in dormant form. Children with atopic dermatitis are more at risk of developing molluscum lesions as the virus gets an easy entry into the skin through the cuts which develop on skin due to atopic dermatitis. Humid warm climatic conditions: Your child is at risk of catching molluscum infection if you are staying in a humid warm environment as these types of climatic conditions are favorable for the growth and thriving of molluscum virus. Weakened immune system as found in individuals infected with HIV or patients undergoing cancer treatment also pose a risk of developing molluscum infection. Keeping in mind all these risk factors will help prevent your child from catching molluscum infections frequently. If your child still keeps developing molluscum, do consider homeopathic treatment for molluscum. Homoeopathic remedies for molluscum help take care of eruptions and also help prevent recurrences. To know more about how Dr Rajesh Shah’s homoeopathy at LifeForce can help take care of your child, do get in touch with us via the form below. You can also call us on +91-2266888888 or email us at info@lifeforce.in with your child’s details.